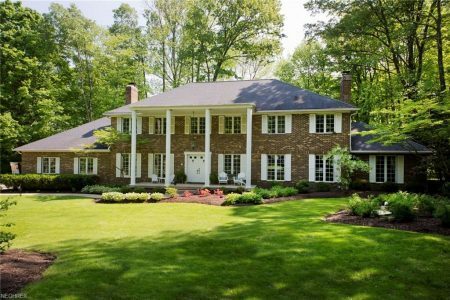 You will find this light and be inviting all brick home on a very private cul de sac, situated on 4 acres of the most gorgeous mature landscape and breathtaking serene woods and trails leading to the Chagrin River. Beautiful custom white cabinetry with granite counters in the kitchen are perfect for the family as well as for the creative chef to entertain many guests. The large eat-in kitchen opens to a lovely and inviting family room with wood burning fireplace. Architectural details are showcased throughout, including crown moldings, built-in bookshelves and cabinetry, and ample windows to enjoy nature at its best from just about every room! The formal living room with marble fireplace flows into the dining area that again has the most stunning views of the property. Wander through the warm and inviting wood-paneled office-library with yet another fireplace to the screened porch which leads to the second deck … perfect to relax after a long day. Generous owner’s suite with spa bath and oversized walk-in closet. Three additional spacious bedrooms along with an optional second office/bedroom and laundry room are on the second floor. Lower level recreation room with bar leads to the paver patio enjoying serene landscape and meandering pathways of the perennial gardens. Gracious living just outside Chagrin Falls village. Call for an appointment!